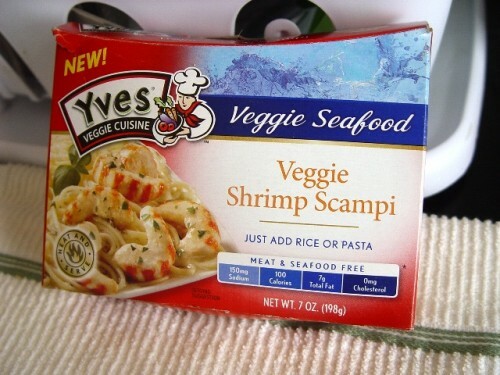 Recently, I picked up a box of veggie shrimp scampi (seen before) partly prompted by my buffet experience but also because I wondered what in the world faux shrimp could be made out of. Now I am not vegetarian, but I’ve dabbled with all sorts of meat substitutes, just for experimentation. Things like the good old veggie burger/Gardenburger, Boca Burgers, weird soy based “ribs” covered with a goopy sauce, Chik’n nuggets but also less processed choices like tofu, seitan and TVP. 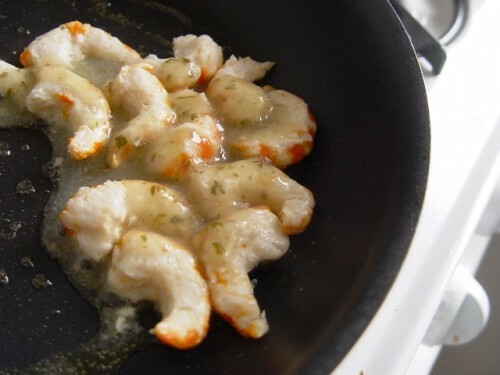 These veggie shrimp are composed not of soy or grains, but glucomannan (used in lots of weight-control related foods), potato starch and whey protein. Nom nom. Obviously creating shrimp from starches is gonna bump the carbs up and knock the protein down (an impressive 1g per serving) but nevertheless, it’s a low calorie meal at 200 calories per box. 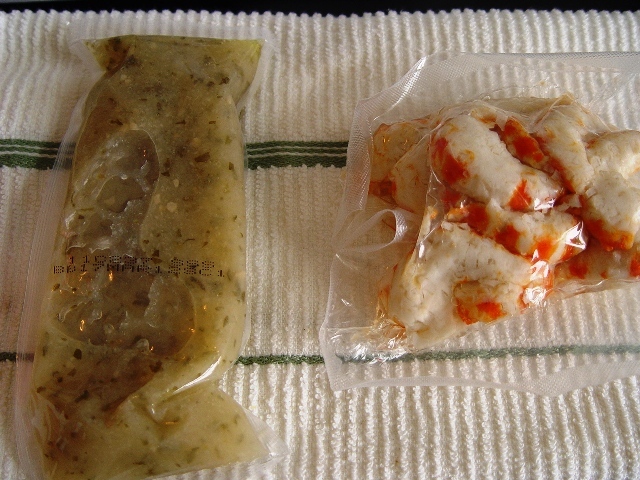 The box including the vacuum-sealed packet of “shrimp” (lovingly colored red with paprika extract) and a goopy packet of scampi sauce, made with garlic purée and canola oil. I’m glad they didn’t pre-mix them, because I can only take so much sauce with my meat-and-seafood free shrimp. Prep was pretty easy. The veggie shrimp is already pre-cooked so I took the liberty of using the fancy, non-bachelor route of actually putting the ingredients in a sauté pan as opposed to zapping it in the microwave. This is another one of those products that I cannot find any official listing on the manufacturer’s site so I’ll go ahead and assume it’s discontinued, given the absence of information and the overabundance of these at my local Grocery Outlet recently (I saw the veggie tuna on sale last week for a measly 50 cents a box, so I might have to pick up one of those as well). I cooked the shrimp until they were deemed “cooked” (lukewarm, in this case) and dosed them out on a plate. I did cook them with the included sauce, but only about a fourth of the packet, as to preserve the delicate glucomannan and potato starch flavor. As far as the taste and texture goes, I was pleasantly surprised. The veggie shrimp successfully obtained a chewy, meaty texture without being too gummy or crumbly. They did have a slight fishy flavor, which I’m curious how this happened without using actual fish (anyone want to weigh in?). I didn’t really care for the scampi sauce. Unlike the scampi I’m used to, it was mainly canola oil as opposed to butter which gave it a slick, greasy taste. Note that I didn’t eat the veggie shrimp with any sort of pasta or rice as suggested, but I imagine those would soak up a bit of the oil. All in all, an interesting concept but looks like it didn’t catch on. 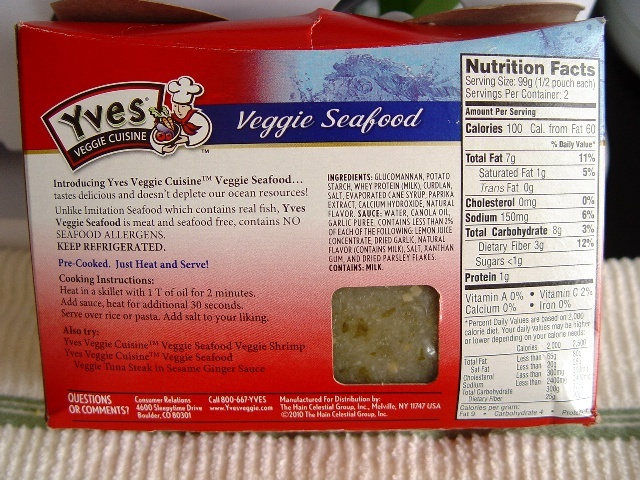 I probably wouldn’t buy these again, mainly because I don’t feel real shrimp are that unhealthy (but I am a meat eater after all) and they’re definitely more filling due to the protein content. Worth a try though if you’re vegetarian and looking for something fishy. This entry was posted on Monday, January 30th, 2012 at 6:24 am	and is filed under Food. You can follow any comments to this entry through the RSS 2.0 feed. Both comments and pings are currently closed.